I was more excited for this episode of Main Event than I have been for pretty much any other and you'll find out why later. 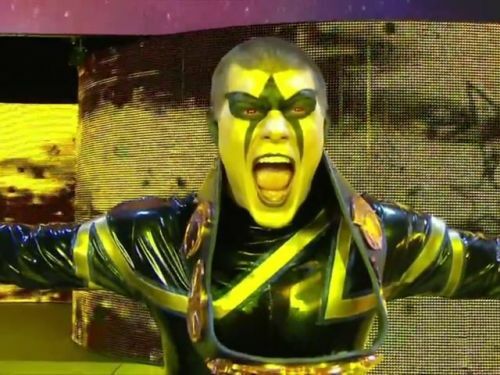 The show opened with Stardust taking on Jey Uso. It was cool to see them in singles matches since they've had about a million tag team matches. This one got about five minutes and was decent but unspectacular and Jey wins with a superkick. The show picks up when Natalya tries to tell Tyson Kidd how much she loves him backstage, but he has his headphones on under his hoodie and fakes like he was listening. Tyson is great. Justin Gabriel gets the jobber entrance as he's already in the ring for the next match. Out comes Curtis Axel and I guess he had to wait for Ryback to come back before he could work again even though they aren't teaming. After about four minutes, Axel gets the win but I don't see this going anywhere for him in the long run. Now, onto the reason I was excited. Sami Zayn tweeted that he was going to be on Main Event! We get a video package to hype him up before he faced Tyson Kidd. Everything about this match worked. Tyson was in full heel mode, celebrating little moves or making Natalya kiss him mid match. Sami was awesome as he got the crowd behind him and they loved this match. It got twelve or so minutes and Kidd won with a rollup and a handful of tights. The match was great and Tyson celebrated like he won a World Title. Go out of your way to see this, it's exactly how I like to see NXT get their shine. The final match on Main Event was a throwback of sorts. The WWE billed it as "Bray Wyatt in action", like they used to in the 90's when a star was clearly going to win a match against a jobber. The jobber tonight was Sin Cara as Bray was allowed to win an extended, dominant squash. I enjoyed it as it was a nice call back to the old days and it was good to see Bray, or any Wyatt Family member, work a match again actually. Overall, another solid episode of Main Event that is worth watching. The first two matches were decent, Sami Zayn and Tyson Kidd were great and Bray's squash made a lot of sense. I'd give this show a 7/10.